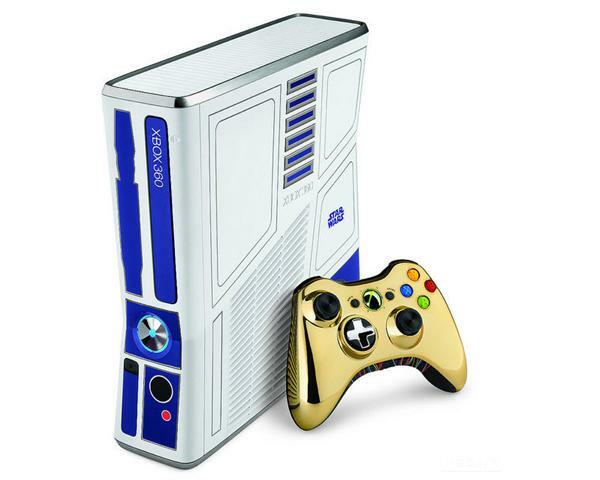 (CBS News) Announced nearly a year ago at Comic-Con International: San Diego, the Limited Edition Star Wars Xbox 360 hit store shelves about a month ago. Retailing for $450, the bundle includes an R2-D2 themed console with a white Kinect sensor and 320 GB hard drive, a C-3PO themed wireless controller, "Kinect: Star Wars" and "Kinect Adventures." It's quite the bargain when compared to the usual $400 Xbox 360 with Kinect bundle and 250 GB hard drive. See the video above for our first impressions of the console. If reviewer and customer feedback are anything to go by, neither "Kinect: Star Wars" or "Kinect Adventures" are the real allure in this package. Both received mediocre reviews at best. The real draw here is the console itself. On top of having a nice matte finish that won't pick up your fingerprints, the R2-D2 console also sounds like everyone's favorite astromech droid from a galaxy far, far away. The little guy makes his signature beeps and boops upon powering up or down and when the disc tray is opened or closed. It even has the plea, "Help me Obi-Wan Kenobi. You're my only hope," printed on the lip of its disc tray. If this adorable console, sleek C-3PO controller and white Kinect weren't enough to get your geek juices flowing, this bundle also sports the Xbox 360's first 320 GB hard drive. Arguably more space than most gamers would ever need, this super-sized hard drive will let you install even more games and download even more content from Xbox Live. Despite the fact that Star Wars fans will be drooling over this console, most gamers who already own a working Xbox console might not see fit to shell out the considerable dough on this new Star Wars-themed edition. Though if you were looking to upgrade your storage capacity or were waiting for the right time to jump on the Kinect bandwagon, you may as well do it in style.